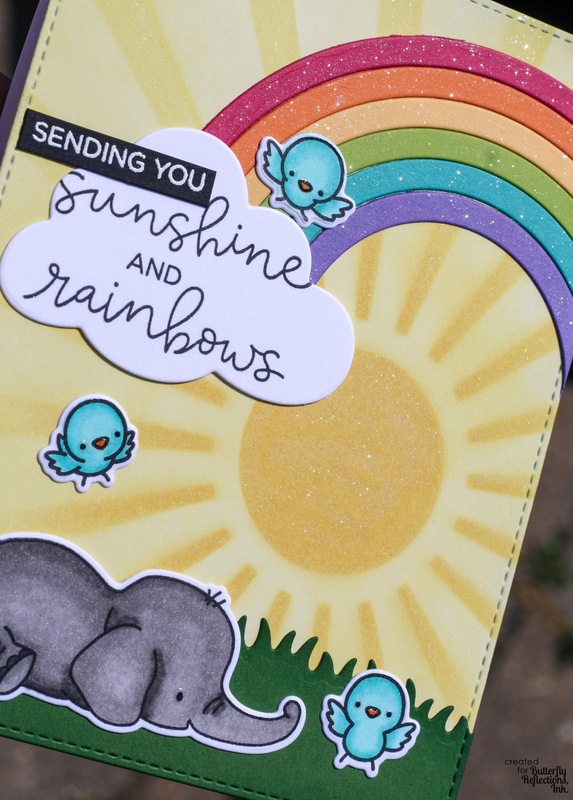 Good morning everyone, Amy Copeland here again with a sunshine and rainbows-themed card using Hello Bluebird products. I used the new stamp set called Puddle Play for the adorable elephant and an older set called McGregor's Garden for the three little birds. I stamped out my animals onto smooth white card stock and colored them with my Copic Markers (warm grays for the elephant and blue greens for the birds). I then used the coordinating dies for each (Puddle Play), (McGregor's Garden) to cut them out. Once my images were ready, I started working on the background. 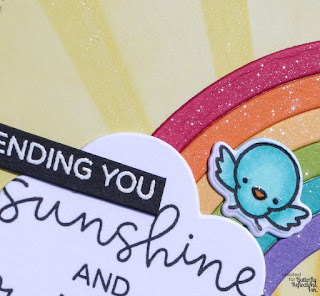 I used this beautiful Radiating Rays stencil from MFT Stamps on a piece of smooth white cardstock with my Distress Oxide inks. First, I applied a layer of Squeezed Lemonade through the stencil with my Mini Ink Blending Tool to completely fill in the sun and rays. Second, I used Fossilized Amber over the circle part and at the "top" of the rays closest to the sun. Finally, I removed the stencil and very lightly applied the Squeezed Lemonade all over the panel to fill in the white spaces and give the whole piece a bit of a "glow." After I had my panel inked up the way I wanted, I used a stitched rectangle die to give my panel some nice finished stitching detail on the edges (This set and this set would be good options). I then applied my Wink of Stella clear glitter brush pen all over the sun and the rays for a subtle shimmery glow. Once I had my background squared away, I used some of the awesome new scene building dies from Hello Bluebird to make my Rainbow and cloud and grass pieces. I used all Lawn Fawn cardstock. The rainbow is made from Raspberry, Canned Pumpkin, Sunflower, Cilantro, Peacock, and Sugarplum. I used Noble Fir for the grass, and I actually inked up the tops of the grass blades and a little bit around the stitched edges with the Coordinating Ink Pad to give it a little bit of extra dimension. I used my MISTI to line up my "Sunshine and Rainbows" sentiment on the cloud and did some selective inking by masking off the "sending you" with Post-It tape before stamping with Lawn Fawn Jet Black ink--the MISTI came in handy because I had to stamp it twice (the first time wasn't dark enough). 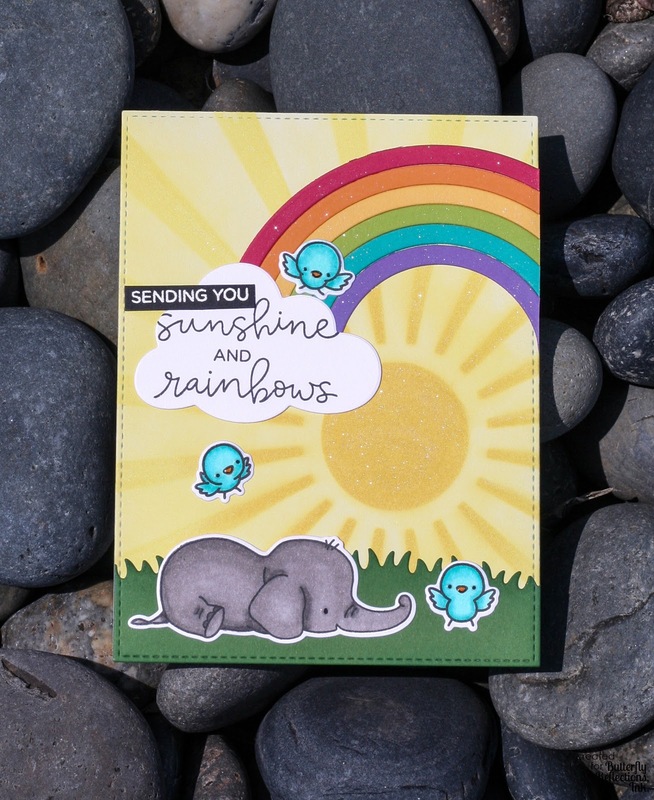 I then masked off "Sunshine and Rainbows" and used my Versamark ink pad to stamp "sending you" onto Black Licorice cardstock and heat embossed it with Lawn Fawn White Embossing Powder with my Heat Tool. After I let the embossing powder cool down, I cut the sentiment into a little strip. Finally, I was at the assembly stage. I actually lined up all of my rainbow pieces face down on my desk and used regular Scotch tape to tape them all together--it was easier to adhere everything exactly where I wanted it when they were all one piece. After the rainbow pieces were taped together, I brushed them with my Wink of Stella clear glitter pen. 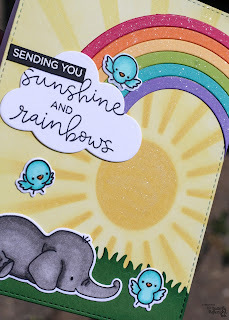 I used Tombow Mono Multi liquid glue to adhere everything down on my card. It was pretty quick once I got to the assembly process--I just glued everything down, turned my card panel over, and cut off the excess rainbow pieces with my paper trimmer. The finishing touch was a tiny bit of Glossy Accents on the eyes of the birds and elephant and on the beaks of the birds.